Today Virospack, always at the service of brands, takes a step further with the launch of its autofill dropper. The new autofill bulb dropper is an innovative dispenser because it's a push button dropper with a bulb inside that has an automatic autofill system. On the market there are other autofill packs, but none with a rubber bulb dropper. Virospack autofill is a first, a unique bulb dropper autofill. Two advantages of Virospack droppers (precision in application and dosage as well as the safety and protection of the formula) now join the accuracy of the in-take of this new autofill bulb dropper. Years of development reward us today with a result of high precision and quality. A high-tech autofill with an inside operating patented system with bulb that ensures an exact formula in-take in every click. Virospack autofill is unique and evinces very high quality, not only in its operation, also in its look. With a premium closure for total control and an excellent number of finishes, with high quality, definition and weight, for a good and satisfying feeling on closure. 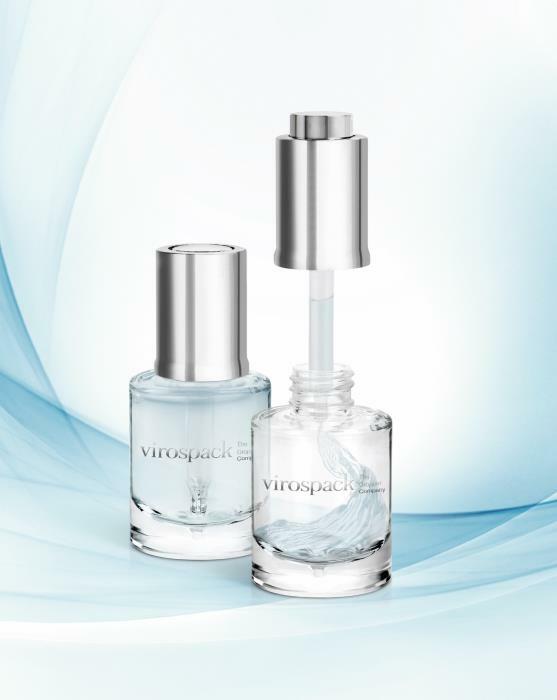 Virospack autofill is the ideal dropper for cosmetics like serums, oils, and low viscosity formulas in general. A precise and safe packaging, with an exact loading, high-tech and quality, totally developed and manufactured at our facilities. With an innovative and unique operating system, it's the first real push button dropper with a bulb and a hermetic closure. It's a precise system and a nice feeling to gestural level very positive connotations in use. Available with bulb of rubber, either nitrile or butyl. With plastic and aluminium exterior, and with wiper inserted in the bottle to eliminate the excess product on extracting the pipette. An autofill bulb dropper easily customizable thanks of our big range of finishes, all done and controlled in-house, ensuring, as always, the final result and answering of the needs and desires of our customers. • Unique autofill push button dropper with bulb. • Available with bulb of rubber, nitrile or butyl. • Available with plastic and aluminium. • High quality finishes for a pleasant feeling of use. • Compatible with our range of moulded glass bottles –Wide and Slim- with 30ml of capacity and high quality and weight thanks to the tick of the button. Available with wiper. • Easy to customize, in-house decoration. At Virospack CSR has been one of the cornerstones of the business since it began in 1956. For over 60 years the Spanish Dropper Company has been working to ensure that every member of the team feels at home, whilst respecting the environment as the home of the business, to ensure minimal impact. As the family business has grown, so too have the measures which the company assures for both a happy workplace and healthy planet for future generations to enjoy. The National Packaging Design and Sustainability Awards seek to promote innovation, design and sustainability in the packaging sector, as well as strengthen the link between the business world and university study. This reflects two long-standing goals in Virospack's CSR plan and its commitment to creativity and innovation, trusting in academic training and motivating young talents as Virospack increases its University support each year. A professional committee of experts in formulation, packaging, full service and accessories, has awarded the original Magnetic Dropper by Virospack as 'the most innovative development in packaging' for cosmetics, at the recent edition of Make Up in Los Angeles. Bringing the extraordinary properties of tea to a further level, Teaology has designed a totally unique technology: Tea Infusion Skincare to create high performance skincare infused with the most powerful antioxidant ingredients. Enhancing differentiation, design and image thanks to the most sensual dropper on the market, Virospack has recently given the classic dropper a makeover with an original curved design of both the bulb and the cap. The new dropper with its delicate rounded lines is more eye-catching and sensual. The Dropper Company continuously works to improve sustainability. Holding fast to a commitment to preserve the environment - and always working to improve upon its commitment - in 2019 there will be a focused effort by Virospack to fight against climate change. Starting the year with new ideas, developments and tools, Virospack is pleased to announce the launch of its new-look website. Designed to reinforce the company's engagement with brands and innovation, the intuitive web site highlights Virospack's values, product catalogue and its services available for brands. Staying true to its in-house DNA and commitment to innovation and service to brands, Virospack has reinvented the push button dropper, developing a new concept that brings together design, opportunity for customisation, and a greater and more controlled dosage. The company also meets client expectations for quality and functionality, two values key to the reputation of the supplier. Sixty years since the company was established, the future looks brighter than ever for Virospack. Sales are on the rise, and the company is now dispatching its droppers to over 20 countries around the world. Isabel Pérez, Chief Operating Officer at Virospack, reveals the secrets behind the company’s increased demand. Committed to design and innovation, and always at the service of brands, Virospack is dedicated to continuous improvement in order to continue trendsetting in the demanding market of the cosmetic packaging sector. Once again, The Dropper Company will start the new year attending its customers at PCD in Paris, one of the most prestigious, international events in the beauty packaging calendar. Virospack has proven that hard work pays off, as the company celebrates its win at the Best Launch of 2018 awards, organised by Cosmoprof Asia in Hong Kong. The Cosmoprof award recognises the efforts of each member of the Virospack team. Pure Marula Oil is the latest product launched by African Botanics, and joins the company's completely modern, all-natural range inspired by traditional African beauty rituals. Pure Marula Oil comes in a smart bottle developed by Virospack, with an easy-to-use push button dropper which enables consumers to dispense the correct number of drops each and every time. Virospack's original magnetic dropper has been announced as a finalist of the 2018 Cosmopack Asia Awards. Visit Booth 6-G09 in Hong Kong and see this innovative dropper alongside the company's latest developments. Virospack presents a new dropper dispenser with an original curved design. With delicate rounded lines, the new dropper evokes sweetness and is subtly seductive. With the help of a dropper dispenser pack developed by Virospack, Too Faced, the make-up brand that knows how to have fun, presents its latest illuminating product, the Bottle of Unicorn Tears. Inspired by the brand's lipstick, Too Faced's brilliant elixir is the stuff of dreams, and Virospack's dropper dispenser pack allows the glitter formulation to be applied drop by drop for a magical finish. Virospack's new cosmetic dropper benefits from an innovative bulb design that combines style and functionality with ergonomics. The dropper features more stylized lines and a taller bulb design with a special curvature in the centre which indicates the best area to action for the intake of the product into the pipette. Virospack is proud to announce that it has received ISO 14001 certification. This is an important achievement to share and was celebrated at an internal event with all the company's employees who work hard every day to respect the environment. The recent edition of MakeUp in Paris proved once again to be a successful event for Virospack. The company attends the professional show every year, setting trends in solutions for make up. With an important investment in R&D, Virospack presented innovative proposals for the colour cosmetic market of dropper packs and spatula packs which were a hit. Galenic has increased its range of serums with Secret d'Excellence, a highly concentrated serum that is presented in a full pack from Virospack. To ensure that this highly concentrated formulation is applied in the precise area at the most precise dosage, Galénic once again trusted in Virospack for its package. With the arrival of good weather, we want lighter clothes, more cheerful colours, fresher tissues... It's time to renew our wardrobe! Liquid foundation is ideal for a perfect, light makeup at this time of year and is best applied with the greatest comfort, precision and safety, drop by drop by a dropper. Isipharma Dermatologie, specialist in cutaneous homeostasis and in the service of dermatology since its foundation in 1987, has extended its Geneskin range with three products presented in a Virospack full dropper pack. Luxe Pack NY 2018, one of the most prestigious and important packaging event in the world once again proved itself a great success. Every year Virospack attends this renowned event as it provides a great opportunity to meet with clients and packaging peers. Patyka and Virospack have combined their extensive know-how in cosmetics in the new serum, Revitalizing Radiance Care. This advanced chronobiological skin-saving serum which is suitable for all skin types is presented in a full pack manufactured and decorated by Virospack. The manufacturer of packaging for cosmetics and the School of Engineering and Design, have given the award for the most innovative 2018 project in packaging for cosmetics. Virospack, The Dropper Company, and the University School of Engineering and Design of Barcelona ELISAVA, celebrated the awards ceremony at an event organized at the Virospack headquarters. Virospack is finishing up all the final details for LuxePack New York, one of the most prestigious shows in the cosmetic packaging sector. It is an annual event in which manufacturers and customers meet and which Virospack, as every year, can not miss. The nail sector continues to grow and, as usual, its peak comes in summer. The boom that the nail cosmetic market has experienced in last years is not new. It is an increasingly large and dynamic market with yet more growth being predicted by trend experts. Geneskin is a complete skincare range of five products that target the origins of skin ageing and help the skin recover its natural balance. The full pack by Virospack is identical to Geneskin Lift Serum Lifting. Virospack is the leading name in cosmetic dropper packaging. Since its foundation in 1956, the Spanish company has become known around the globe as "The Dropper Company" as its cosmetic droppers are chosen again and again by leading international brands. We caught up with Gustavo Bay, Virospack’s project leader for the Magnetic Dropper concept to learn what we could about the new offering and how it’s set to change the way droppers are used in the home. Revitalising Duo Serum is a new generation serum, a bi-phase liquid serum treatment, rich in nourishing and hydrating agents, formulated with a patented-pending, innovative encapsulation technology by Galenic that traps the oily phase within the moisturising phase during agitation, creating a fluid and homogeneous dispersion without any greasiness during application. Both phases are presented in a full pack by Virospack. The cosmetic packaging manufacturer and the school of engineering and design join forces to encourage creativity and innovation in the packaging sector. The collaboration consists of the creation of a Virospack dropper design by a selection of ELISAVA students. Virospack, with a great number of visitors to its stand at PCD, shared its latest development with the cosmetic sector, an innovative and unique dropper on the market with a patented sealing system using magnetism. It is a technological and innovative dropper that has attracted the interest of many brands. Innovation, technology, expertise, engineering, development, sealing, attraction, power, waterproofness, safety, usability, image, magnetism, trend, quality ... are precious attributes that join in the latest development of Virospack giving shape to a reality that we present today. A genuinely innovative dropper that is a breakthrough and new concept in the dropper market, a dropper with an exclusive closing system that will undoubtedly become a trendsetter in cosmetic packaging.